Transactional emails are an important way to keep users engaged when you're building a community site like UnFake.us. It's importation to pay attention to details to keep users clicking on them and coming back. Unfortunately, development work on email is a bit of a chore. You have to either clog your inbox with test emails to test every little change or at best configure another awkward solution to open them in a browser. The restrictive HTML requirements are painful to work with, especially the need to use inline styles. I built some simple infrastructure to make email development workflow so much easier. 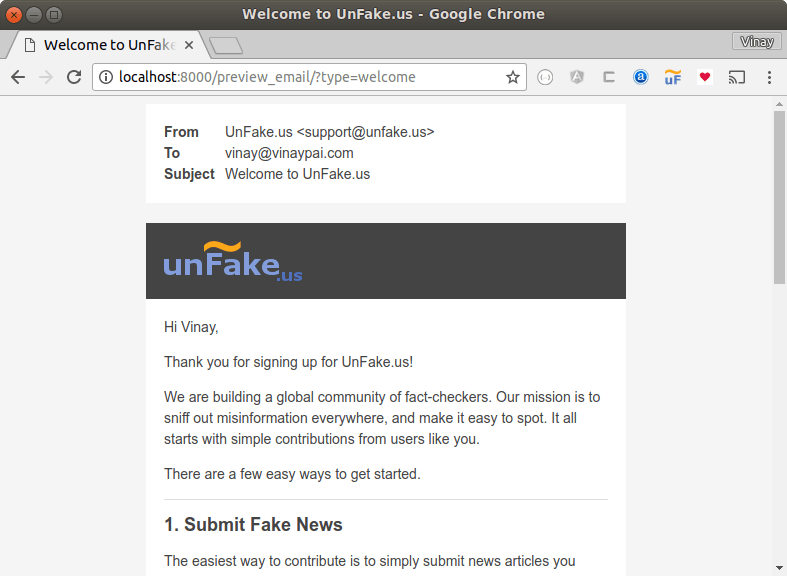 I've built UnFake.us in Django, but the basic ideas should apply to any platform. Sending a formatted email means generating three strings: the subject, the HTML body, and the plain text body. The most obvious way to do this is to out each part in its own template (say welcome_email_subject.txt, welcome_email_plain.txt, welcome_email_html.txt) and using render_to_string. This can get a bit annoying to manage because you have three separate files to edit and keep in sync. 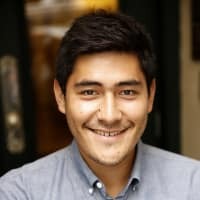 Why not leverage blocks? The django-render-block package is perfect for this. It gives you a render_block_to_string function that works just like render_to_string, but gives you the contents of a specific block. All you have to do now is define a single template with separate blocks for the three parts. This is an example email. All we have to do now is create a template that extends base.html, and override template in a child class of Email and we're on our way. Of course, the HTML and body for this is likely to be a lot more involved than that, with a lot of boilerplace. In fact, the standard way to structure HTML emails involves two nested tables with all the content going into a single cell of the innermost table. It would be pretty wasteful to have to keep repeating that. Of course, we can leverage template inheritance nicely to avoid that. You received this email because you signed up for an UnFake.us account with this email. If you do not want to to hear from us, please reply to let us know. You can still inherit from base.html, but you don't need to override all of html most of the time, you can just override the html_main block and write a much simpler document. While we're DRYing things up, why not generate the plain body from the HTML one? We can always specify one manually for the most important emails, but the generated body should be good enough in most cases. HTML2Text to the rescue. It's pretty common for an email to take a User object and present some information from related objects. You also want to make it easy for users to unsubscribe from specific types of emails. Those are handled with boolean fields in the user Profile. Let's encapsulate that. Now it's pretty easy to write a view to preview emails in a browser with very little effort. Now I can easily preview emails in the browser. I also use django-live-reload in development, so I can edit template files and code and see the effect instantly in the browser window without having to reload the page. Another thing that makes developing HTML emails painful is the need to use inline styles. Unlike normal webpages, you can't just have a style block and rely on user agents to render them properly. You really do have to put style="..." attributes on every element you want to style, which makes the simplest thing like "make all my links light blue and remove the underline" rather painful. I made that easier with a little custom template tag that reads styles from an external file, and spits out a style attribute. I could have just defined styles in a dictionary, but with a little bit of help from cssutils can keep it in a .CSS file which makes it play nicely with code editors so I get the correct syntax highlighting, autocomplete etc. I stripped out some of the code from this example to make it simpler, but I have all kinds of additional functionality that can be easily added with this base. The Email base class parses the email and automatically prepends the base URL to any relative links. The send function records a log of sent emails in the database and calls an after_send method if it exists. The after_send function in some of the email classes do housekeeping tasks like record which notifications have already been sent to the user. My view function is a bit more complex so I can preview emails that take more than just a user (but it builds on the same idea). I'd welcome any comments, suggestions, or questions! Interesting approach, but I don't see any big advantages of using blocks instead of full template files for templates. In one of my projects, for each email I am using two templates: one for the HTML version and one for the text version. All of those email templates are extending either HTML or text base template. So all of the emails are automatically branded the same: the same header and footer, the same styling, the same signature. I would see the blocks approach useful only if they extend some common base and have a specific view which shows both versions, text and html, in a single page. I personally prefer having it in one file, but that's just a personal preference. How do you deal with subject lines? In the past I've had to have a single line file for the subject, which I find pretty obnoxious. As the subjects don't contain any template information, I am passing them to my email sending function as simple strings from the view or from the form. IMHO subjects should be more than just simple strings. They're the first thing the user sees when they get the email and I want it to be as informative as possible. For example if they have a single notification it might read "Aidas Bendoraitis commented on your post" if there are multiple comments it might read "3 people commented on your post" if there is more than one kind of notification it might read "You have 4 new messages". You could of course generate those kind of strings in your view function, but I prefer to have it in the template rather than code.